Gibraltar is one of the British overseas territory which is located at the southern tip of the Iberian Peninsula. Gibraltar is not the part of Spain and also not independent country. It is British colony and the people of Gibraltar have facility to go British and also have a lot of freedom, people from Gibraltar enjoy it. Gibraltar has British and Gibraltar both citizens. The Gibraltar has population 30000 mostly are Gibraltars. The landscape is dominated by Rock oof Gibraltar at the foot. Gibraltar is situated in Europe . It is located between Spain’s southern part and Morocco’s northern part Britanran sea. We know the famous strait of Gibraltar which connects Mediterranean Sea to Atlantic ocean through strait of Gibraltar. Here, the famous Rock is situated which is known by the Rock of Gibraltar. It is British overseas country we can say rather than colony a relevant word. Britan has currently 14 overseas territories. 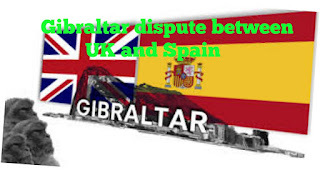 As we said above paragraph that Gibraltar is located on the south-estern tip of the eurEurop continent, the Iberian Peninsula which includes countries like Portugal, Andora and Spain and the British crown colony of Gibraltar. How is Gibraltar part of British ? As we know British has currently 14 overseas territories and Gibraltar is one of them and still at present it is owned by UK. Gibraltar was part of Spain but in 1704 Dutch(Netherland) and England both together attacked on Spain. It was navy attack, here Spain was defeated badly and Spain hand over it’s territory (Gibraltar) to London in 1713. But, Spain wants it back ever since. But, In recent two referendum of 1968 and 2002 the people from Gibraltar chose not to go with Spain and wants to remain under British rule. Gibraltar is important on world map as it connects Mediterranean Sea to Atlantic ocean. Why is it important to Brexit ? In 2016 in UK a referendum was passed to exit Brexit from European Union and also in Gibraltar same referendum was held about to exit from EU or not. The Brexit mostly favoured to exit from EU. the people from Gibraltar who lives in Gibraltar are British citizens, so they also got to vote in the EU referendum. But, In Gibraltar 96% people choose to remain in EU but will be living with rest of the UK. It became complected problem as Spain see the people from Gibraltar don’t want to exit from the EU. Brexit deal is important for British but Spain can use veto power to it. Britan wants Brexit should done easily/smoothly but Spain is opportunist that they eiwi press option of Veto if Spain doesn’t get authority in Gibraltar. Spain put it’s demand in front of Britan regarding decision making power in Gibraltar otherwise they will not support in Brexit deal. Spain’s PM Pedro Sanchez told in a press conference and from it’s statements it is clear that Spain will be upper hand in Gibraltar as Britan will exit from EU even though Gibraltar is overseas territory for Britan it will remain under EU. So, Gibraltars dependency will increase in upcoming days. So, because of Brexit deal weakness Spain got authority/influence in Gibraltar. So in this way in dispute between UK and Spain on Gibraltar issue Spain is emerging and there will be interference of Spain in Gibraltar in upcoming days. Visit – NMK for latest job .